Your browser does not support scripts, use the links at the bottom of this page. We are committed to your success! It is important to learn in an environment which provides ample one-on-one coaching, even in a group class. That is why we keep an appropriate student/teacher ratio. If we have an exceptionally high demand for a specific class, we will create a 2nd class to keep our numbers at a reasonable level. 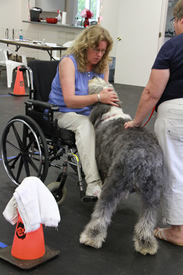 Our dog training classes average about 6 -7 dog and handler teams, they run for 6 weeks and cost $150.00. Early socialization is critical to the development of puppies up to the age of 16 weeks. They are discovering the world and drawing conclusions based on their experiences, which will last a lifetime. GOOD PUP! Supports both puppy and owner during this extremely sensitive, and sometimes trying, time period and includes the basic behaviors of come, walking on a loose leash, sit, down, and stay, and also integrates games and other activities to build confidence in the young puppy and enthusiasm for future learning. This class is available to puppies between the ages of 8 weeks to 20 weeks. (We don't wait until our children are teenagers before sending them to school, so why delay your puppy's education? This class is the perfect follow-up to "GOOD PUP!" or as a "stand alone" for all dogs over the age of 20 weeks. "GREAT BEGINNINGS!" focuses on the behaviors of walking on a loose leash, sit, down, come, stay, as well as more complex behaviors such as wait, leave it, settle, and a moving down. The ideal class for the family dog. First–time dog owner, or seasoned trainer, this class is a "must" for the opportunity to accustom your dog to responding to your signals with mild distractions. FREUD FOR FIDO! Private Behavior Consultations. Solutions for behavior issues. Our Counselors are trained and experienced in identifying and resolving behavioral problems. Under the careful guidance of our Counselors, you will learn problem solving techniques and protocols to help you and your dog achieve balance and harmony in your relationship. A FOCUS class, emphasizing all the behaviors that contribute toward making your dog a truly enjoyable companion -- in the home, and out and about. Teach your dog polite greetings, waiting at doors, walking past other dogs, being attentive to you, and other daily skills that your dog should have so that you can enjoy your time together. Also tips and pointers on being a good dog neighbor. This class is for dogs and handlers who have completed "Good Pup!" "Great Beginnings! ", or the equivalent. Find solutions to problems you may be experiencing. Improve your relationship. Reinforce your leadership position. Regain some control. Like all our classes, this class is taught in a fun, motivational way. We even have a field trip planned! The Canine Good Citizen program is a two-part program that stresses responsible pet ownership for owners and basic good manners for dogs. The CGC class will help you to prepare for the Canine Good Citizen 10-step test. Dogs passing the test receive a certificate from the American Kennel Club. This is a wonderful opportunity to further improve your “team” skills with your dog and enjoy the fun challenge of preparing for a goal that will proclaim that your dog is, indeed, a “good citizen”! This class addresses the two most common challenges that people experience in helping their dogs to learn the skills that contribute toward creating enjoyable companions. What we most often hear from folks is “My dog won’t come when he’s called” and “My dog pulls on the leash”. The focus of “Total Recall!” is on laying the foundation for a Really Reliable Recall and Polite Leash Walking through a variety of techniques and exercises while gradually adding distractions to the training environment. "Agility" – a dog sport in which a handler directs a dog through an obstacle course in a race for time and accuracy" – as defined by Wikipedia. 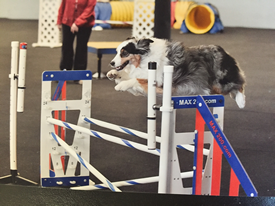 Ask anyone who does agility with their dog and they will tell you it is SO MUCH MORE! This is a FUN, fast-paced course which helps to build handler focus and self–confidence in your dog. It includes foundation exercises to acquaint you and your dog with familiar agility obstacles such as jumps, tunnels, chutes and planks. Have fun mastering the obstacles that were introduced in "Introduction to Agility". Add speed and precision with the goal of working off-leash. Master the new obstacles; dogwalk, a-frame, weave poles, and teeter. Have FUN running with your dog! An exciting new sport! This class focuses on teaching you how to encourage and develop your dog's natural scenting abilities by using his/her natural desire to hunt and interest in food, toys, and activity. 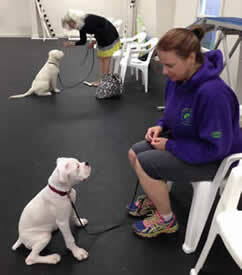 Your dog will use lots of mental and physical energy in this class! 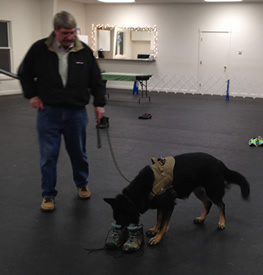 This sport is based on the foundation skills of K9 detection - taught with positive, fun, and motivational methods. These classes are designed for the dog handler teams preparing for competition in the obedience ring, to enhance the bond that you have forged with your dog through your previous training. "Attention" training is an integral part of this class. Watch your dog become more attentive to you as you learn to develop a working relationship with your dog. Discover the joy of heeling, and the fun of mastering the other obedience exercises at each level. This class is a great opportunity to get your dog out to a new location! We will have visiting "judges" every few weeks to go over the dogs. This class is perfect for the seasoned handler as well as those new to the sport. No experience necessary. Come, find out what goes on in the Show ring!